Looking for a reason to give Entitle's book club style subscription plan a try? Check out this deal. Entitle is running a sale for the next week on Stacksocial. They're offering a 6 month subscription for the low price of $39.99. This is good for 12 books at a price of about $20 off the regular subscription price. 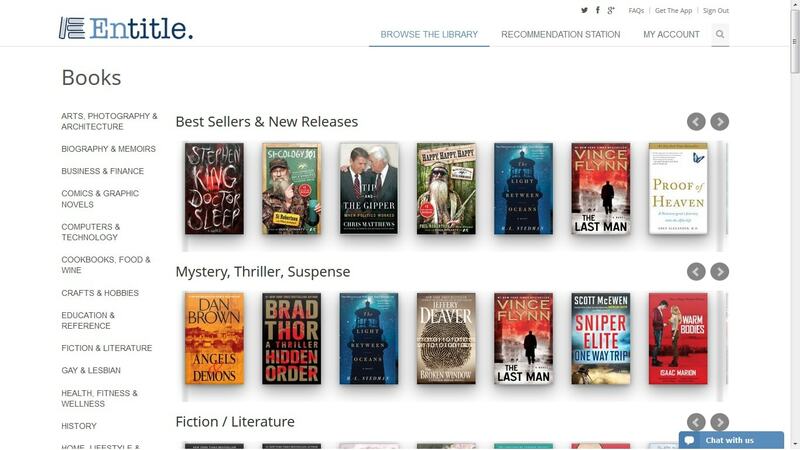 Entitle has a catalog of around 150,000 titles, including best sellers from several major publishers. They offer a subscription plan similar to Audible, and it costs $9.99 for 2 book credits. The ebooks can be read in Entitle's ebook apps for Android or iOS, or they can be downloaded to your computer and transferred to an Epub compatible ereader of your choice. DEAUTHORIZE your copy of Adobe Digital Editions by hitting Ctrl-Shift-D (Cmd-Shift-D in OS X). Do not worry, you will be prompted to re-enter your Adobe ID when you try to open a previously authorized book. Authorize your computer with Entitle. If I have to deauthorize my computer and need to re-enter my Adobe ID for previous books, what do I do for new books that are not from Entitle? And can I read books from two different Adobe IDs on one ereader? I have gotten the files to my PC, so I can confirm that this works. I haven’t had a need to go further. You’ve gotten them to your pc, but can you do both Entitle and also buy or borrow from anywhere else that uses Adobe with the same pc? Also, I forgot to ask about DRM – can you strip Adobe DRM from Entitle books? If not, I see no reason to use them. In order to read on my preferred Android apps I need to have no DRM. Even ones that I use with Adobe can only use one Adobe ID as far as I know, but since I always strip it I don’t know that for sure. No, it appears that you can only have your compute registered to Entitle’s ebookstore or to another ebookstore, but not both. Thanks. That makes Entitle completely worthless to me unless I just download all 12 books and don’t use Entitle again. But it would be my luck that authorizing Entitle would take my over Adobe’s limit and have to go through the hassle of getting CS to reset it so I could authorize my own ID again. Ain’t drm lovely. I wonder what they think they’re accomplishing by doing the DRM this way instead of just letting folks use ADE registered to their Adobe ID like every other store & library do. They didn’t realize, not until after I raised a stink, that claiming to sell ebooks meant that they had to actually let customers download the ebooks to their PC. To be fair, there are ebook retailers which lock you inside of their app. So even though Entitle isn’t a great option it’s also not the worst option. Yes, others lock you inside of their app, but how many lock your pc to their store?